There are many variations on the name of this man who is recognized as the first Italian to settle in America. It is thought his name was Pietro Caesaro Alberti, born in 1608 in Venice, Italy. Some sources say he is the son of Andrea and Veronica Cremona Alberti. Nevertheless 334 years before my birth, he and my paternal 7th great grandfather, Pieter Monfoort, would be doing business together in Niew Amsterdam. The irony here is the line of descent from Cicero Alberti extends to my mother. What are the odds of two ancestors of my parents would have roots in Niew Amsterdam in the early 1600's. On my mothers side Alberti is my 10th great grandfather......all of which probably explains a need to talk with my hands. A marker stands in New York City’s Battery Park near the statue of the explorer, Giovanni de Verrazano, honoring the memory of Pieter Cesare Albertus/Alberti. The marker was placed there in 1981 by the Italian Historical Society honoring the man who was the first Italian to settle in the New World. For certain, he arrived in Nieuw Amsterdam aboard the "deCornick David" captained by David deVries in late May of 1635, as a member of the twenty five man crew. The ship was experiencing problems requiring it to dock for repairs near the tip of Manhattan Island. Alberti took this opportunity to leave the ship and end his life as a mariner. Indian threats of attack were still common, as was a threat by the English to take over the Dutch colony. The Dutch called him Peter the Italian and here is where he would stay, in spite of the problems that seemed imminent. Little is known about Alberti before his arrival at the Dutch colony. Some say he was from a wealthy and prominent family in Venice with connections to the Vatican yet there is no proof of this yet found. He seemed to have been well liked by the Dutch, stayed out of trouble and earned his own way among the colonists. There is some speculation that he is the Alberti whose name was stricken from the Blue Book of Aristocrats in Venice in 1639. Alberti brought suit against his former ship’s captain in January of 1639, for past due wages from a voyage with deVries in 1635. The suit, filed in Nieuw Amsterdam, was opposed by the captain, stating the sailor [Alberti] had deserted the ship and was not entitled to the wages. A credible witness was produced by Alberti, who in testimony, stated Alberti was justified in leaving the ship because of threats made against him by Capt deVries once in Cayenne and again in Virginia. The court gave their verdict in favor of Alberti. 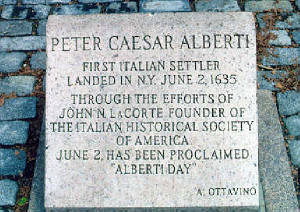 Shortly after the winning verdict, Alberti entered into a contract with Pieter Monfoort, one of the first documented settlers sent by the Dutch West Indies Colony, to settle Manhattan and Long Island. It is most likely the wages he received from deVries that were used to build a home and plantation, with Monfoort, for growing tobacco. The combined plantations were at the Waal Bogt or Bay of Foreigners with the farms being located in what is now present day Brooklyn. They had 700 feet of frontage on the East River at the Waal Bogt along what is now the current streets of Claremont and Hampden Avenues. Three men took out patents to grow tobacco and it is not known which came in with the first crop...but Alberti and Monfoorts plantation would have been either the first or second farms to produce the lucrative crop in the Dutch colony. Judith Manje became the bride of Pieter Cesare Alberti on August 24, 1642, according to records of the Dutch Reformed Church of Nieuw Amsterdam. She was the daughter of Jan and Martha Chambert Manje, most likely Walloons. Jan Manje was one of the very few men of the Dutch colony to be killed during Kiefts Indian War in 1644. Cesare and Judith set up housekeeping [first on the Heere Graft of Broad Street for at least ayear] and soon were producing more than tobacco. Seven children were born to them and baptized in the Dutch Church at Nieuw Amsterdam. They were Jan [John], Marles [Martha] ,Aert [Arthur], Maritje [Mary], Francytie, Willem [William] and Francyn. Francytie died in infancy and Marles may not have lived to maturity. Peter Monfoort and his wife, were named as godparents to several of the children. Both husband and wife died in 1655 during an Indian raid at the Waal-Bogt. Their surviving children were placed under guardianship until they reached adulthood. It is not known if the children were there to witness the deaths of their parents or hidden from sight for their protection. Jan or John as he became known, married Elizabeth Scudder, daughter of John Scudder. Their daughter, Elizabeth born about 1670, would marry Dr John Stewart [1660 Scotland-1667 New Jersey]. Among their direct descendants through her maternal line is the narrator of this website.